Google has celebrated its 13th anniversary with a birthday-themed Google Doodle. 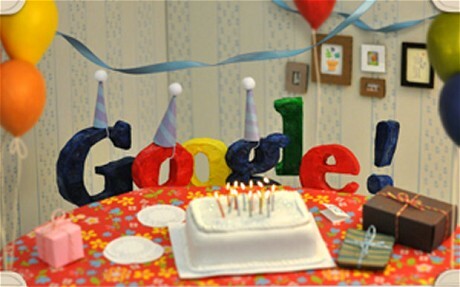 The search engine marks entering its teens by turning its home page into a birthday party scene. Surrounded by multi-coloured balloons and streamers, its logo is adorned with party hats and sits behind a table heaped with wrapped presents and a large white birthday cake with 13 candles. Although Google’s founders, Stanford University graduate students Larry Page and Sergey Brin, built their first search engine in 1996, it was not until 1998 that they formalised their work and created Google. The company filed for incorporation on September 4, 1998, and the Google.com domain was registered on September 15. The search engine officially celebrates its birthday on September 27. The pair came up with the name as a play on the word â€œgoogolâ€, the mathematical term for a 1 followed by 100 zeros. “The name reflects the immense volume of information that exists and the scope of Googleâ€™s mission: To organise the worldâ€™s information and make it universally accessible and useful,” claims Google. The artwork is the latest doodle since the search engine began dressing up its logo in August 1998 with a design themed on the Burning Man festival. The anniversary comes at a time when the company faces increasing legislative scrutiny and is locked in an intense rivalry with the social networking site Facebook. The search engine recently launched its Google+ social networking service to all users, in an effort to counter Facebook’s rising popularity. Research from Nielsen earlier this month showed that US internet users spend more time on Facebook than any other website. However, other research shows that Google enjoys a 90 per cent share of the global internet search market.